SEOUL, Dec. 20 (Yonhap) -- Filipino boxing legend Manny Pacquiao arrived in South Korea Wednesday for his winter vacation and to meet fans here. Pacquiao, the only boxer in history to win world titles in eight different weight divisions, will spend eight days in South Korea with his family, officials here said. During his visit, the 39-year-old will film an episode of the popular television entertainment show "Infinite Challenge" and do a meet-and-greet with fans. Pacquiao, who also serves as a senator in the Philippines, is scheduled to meet Seoul Mayor Park Won-soon next week. He is also expected to visit the National Assembly and meet with lawmakers during his stay in South Korea. This is Pacquiao's second visit to South Korea since he visited the country last December. 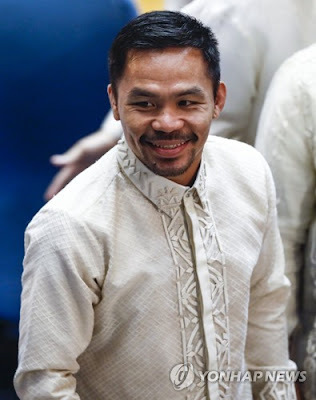 For his second visit, Pacquiao will travel to popular South Korean tourist attractions such as Nami Island in Chuncheon, Gangwon Province, and Insadong in central Seoul. Pacquiao recently made headlines after he posted Ultimate Fighting Championship (UFC) star Conor McGregor's photo on his social media and told him to "stay fit." Pacquiao has 59 wins, seven losses and two draws in his pro boxing career. His most recent bout was in July in Brisbane, Australia, where he lost the World Boxing Organization welterweight title to Jeff Horn.